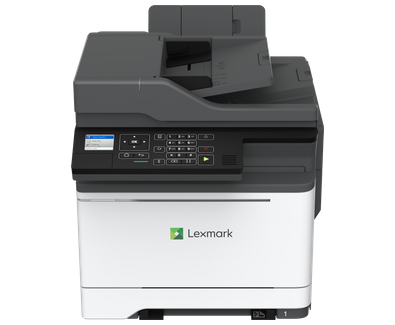 The Lexmark CX421adn packs reliable, productive and secure color multifunction performance into a small-footprint package with output up to 25  pages per minute*. Driven by a 1.2GHz quad-core processor, the CX421dn prints up to 25  pages per minute* and can scan up to 50  images per minute. With its steel frame, long-life imaging system, ease of upgrades and robust paper feeding system, it’s ready for lasting performance in any environment. With its small footprint, the CX421dn is easy to find a place for. And the new front-panel power button and direct-print USB port, 2.4-inch colour LCD with keypad and secure browser-based device management make it easy to interact with.